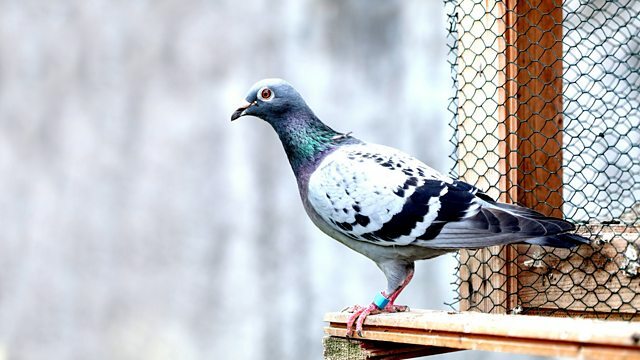 After a pigeon is sold for £1 million, Sean is learning more about keeping them. Can you catch one by putting salt on its tail? After a pigeon is sold for £1 million, Sean is learning about keeping them. The Pawnbroker's daddy had a pigeon called Rocky Red. Joe in Loughinisland says that anyone who kept pigeons always had a white pigeon because the white pigeon is the one that brings the rest of the flock in. Davy says that was when you had tipplers and you needed to get them in at a certain time and the other birds fancied the white one. Pigeons have three eyelids, says Wee Tee. Kenny wonders if they have three sets of eyebrows too. Can you catch a pigeon by putting salt on its tail? John in Belfast says if you're close enough to put salt on its tail you're close enough to catch it. Music from Buddy Holly, Ali Campbell, Temptations, Fisherman's Friends, Bonnie Lou, Pecker Dunne and more.